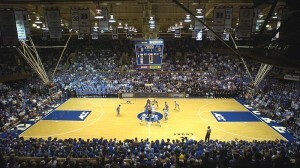 Cameron Indoor Stadium is one of the most famous basketball venues in the world. 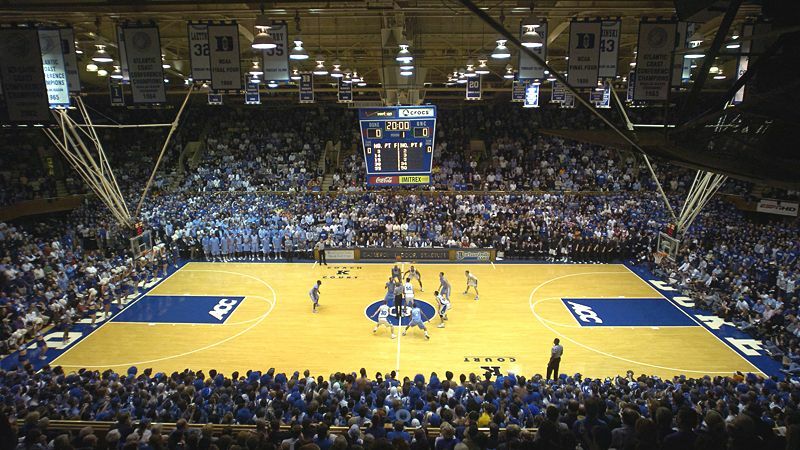 The design of the modern basketball court goes back to the earliest days of basketball in the 1890s. In these formative years, the game was played in YMCA and school gymnasiums across the country – wooden floorboards and peach baskets nailed to the wall made up these first basketball courts. Though the baskets would be eventually replaced with a hoop and net, and outdoor basketball would be played on a variety of asphalt or tarmac services, the wooden surface inherited from those first gymnasiums persists to this day. Maple boards are most commonly used in basketball court surfaces, prized for their consistency when dribbling and providing good grip characteristics for players. However, as a hardwood, it can be adversely affected by moisture and consequently maple boards must be laid to take into account the expansion of the wood over several years. Poorly laid floors can suffer from “dead zones” where the ball won’t bounce as well – frustrating for players.